Last night something strange happened. I was getting ready to shut the computer off after a night of writing and a friend request came in on Facebook (FB). Before I accept a friendship I look for shared friendships if I do not know the person, many who friend me are part of the gardening community. The friend request came from a young man who had no mutual friends with me. I peeked in on his timeline to see if I could find something there that would make me feel comfortable to accept him as an FB friend. I did not. Normally I would have ignored the request, but then I saw that he was from the Kitsap Peninsula, and went out of my comfort zone and accepted his request. He immediately private messaged me and I thought, oh boy a spammer or creep. (They usually play their hand right away.) I opened it up and it read, "Hi there Miss Teashon! We don't know each other but I was going through West Sound Home and Garden magazine and found some pictures of your garden displayed. I was wondering if I could ask you about one of the plants you have pictured?" Phew, he is not a spammer; he is a young man with an interest in plants. "Sure, I don't mind," I wrote. "Thank you There's a picture of a single purple wavy leaf with a green/white stripe going through the middle of it, I have searched up and down the internet trying to figure out what it is but have had no luck, could you tell me what it is?" Now I had no idea what he was talking about so I picked up the WSHG magazine and leafed through it to see if I could find this interesting plant I had growing in my garden. Turns out it was one of Barbara Sanderson's Glass Gardens NW When I told him what it was he laughed and said his mother really liked the plant and wanted it. He wanted to get it for her for Christmas. He wanted to know who made it so I sent him over to Barb's web site. In closing he said, "It definitely does, even though I feel really ridiculous now haha. Hey thank you for helping out, especially this late." “Don't be, I think that is very cool! Thanks for telling me and hope you can get her one of Barbara's pieces." “That's the mission now, keep up the good work my mom loves your pictures and garden, have a good night!" “Thanks! You have a good night too." I shut off my computer feeling like a helpful little elf and blessed by the words of such a sweet young man. After more than a week of below freezing temperatures and cold winds, most of the perennials are dry, brown husks and yet to my eye, the garden is still beautiful and interesting. I love to be out in my garden in the winter. The smallest details have more impact. Evergreen or variegated plants, rocks, and paths all provide structure and interest in the winter garden.Although the ferns in this photo to the left, have dry edges, they have a lovely texture and color and provide contrast with the browns and grays of the log. A light, morning snow delineates the intricate details of moss and ice crystals on the leaves and in the frozen soil of this photo. The maidenhair fern, (Adiantum sp. 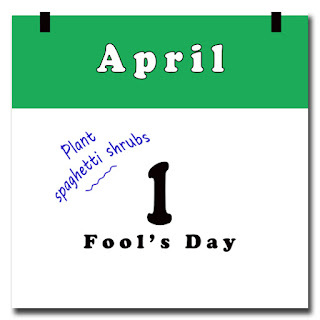 ), curls its leaves in an effort to protect itself from harsh winds. Rhododendron, camellia and other large-leaved evergreen trees and shrubs use this same mechanism to conserve water. Here, the basalt rocks define the edge of the bed, providing structure and separating the garden from the path. Again, snow provides an added punch to the scene, accentuating the curve of the path. Foliage also plays an important role in the winter garden. .
Small, waxy leaves like the blue needles of Pinus kwantungensis, in the photograph to the left, are another method for conserving moisture and surviving cold, dry winds. This pine, like many other conifers and the nandina (Nandina compacta) pictured deepen or change color with cold temperatures, adding another level of interest to the winter garden. The rich, green leaves of bamboo (Fargesia murieliae) offer much needed color along with a contrast in texture to the serrated edges of the sword ferns (Polystichum munitum), and small, rounded leaves of the nandinas (Nandina domesticata) in the background. Oh really? 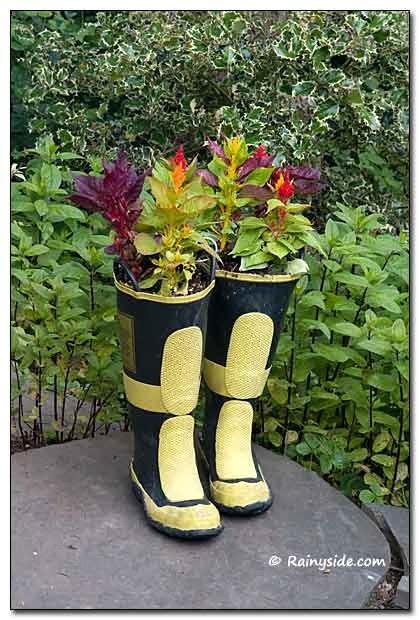 These boots are made for planting! That’s what Sally Hewett planted out in her Bainbridge Island garden. 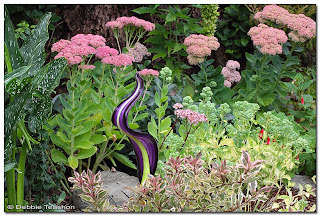 I visited the Hewett garden as part of the Garden Conservancy Garden Open Days. 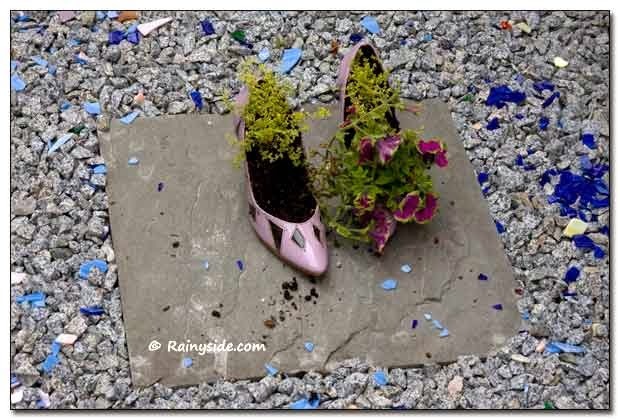 I believe this garden owner loves shoes! Shoes are a definite must when touring the property. I wasn’t too keen on the bits of stained glass chards strewn about. Although it looked wonderful, all I could think about that I would be hollering ouch, ooch, eech, for my poor bare footsies had I not been wearing shoes. It's my only complaint for this beautifully planted space that overlooked Puget Sound. I loved this garden. 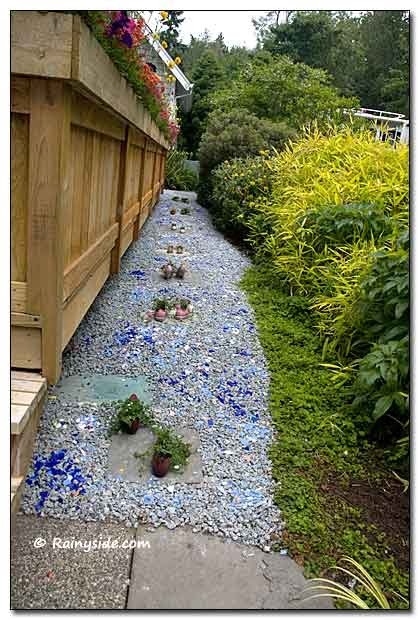 Photos below, show a designated footpath, a shoe-way going down the side garden. 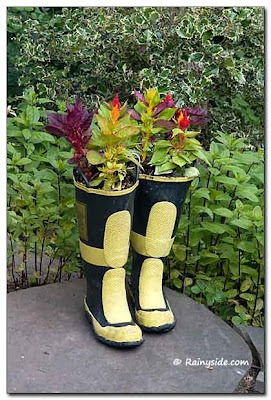 The clever plantings in shoes I want to describe, using only clichés. Enjoy! 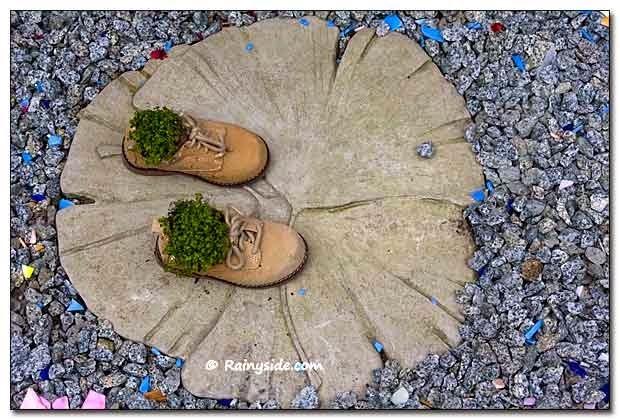 Awww, cute little toddler shoes planted appropriately with baby tears. Finally, another use for high heels: after you aerate the lawn with them, plant and forget about all foot torture devices. 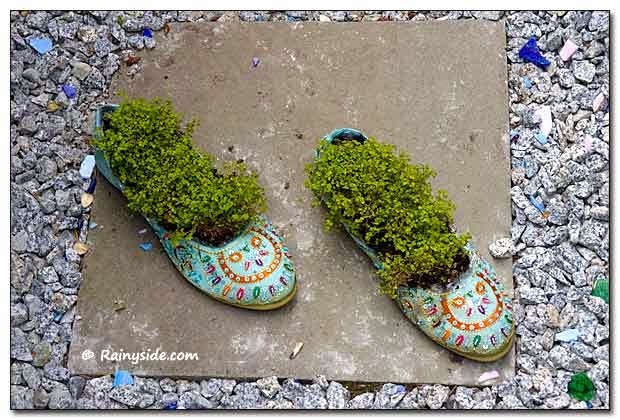 And last but not least ,the embellished garden slippers to protect your feet from glass shards. Gift Ideas for Gardeners Helps You Save! I know the title makes me sound like a walking commercial. Please understand that I am writing this after watching Kevin Bacon’s humorous commercial (see silly informercial-like video below) about buying locally. Most friends and family members, know that I harp talk about the importance of buying locally. I love gifts that help the local economy, and our communities. Strong, vibrant communities are important for our children, health, our well-being, and us. Every time I choose a small business over a giant chain store, I feel satisfaction knowing that those dollars stay in the community. I want a good portion of the money I spend to stay local—it’s a win-win situation! Here are a few more gift ideas for gardeners from Northwest-based companies. This handy tool should be in every gardener’s arsenal. 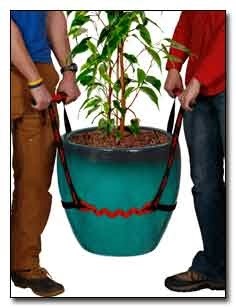 This affordable gadget is worth a lot in terms of saving you from back strain after lifting heavy or awkward containers full of soil and plants. Another body is the only necessary accessory you need to move your containers around. You can also use the pot lifter on other heavy objects too, such as stones, hay bales, or bags of cement. Even better is a 20% discount for you, our Rainy Side Gardener readers, which is good through January 31, 2014. You can use it to buy a gift for someone else, or after Christmas you can use it to buy a practical tool for yourself as the discount code applies next year! Use the coupon code: rainyday0131 upon checkout at their site. Although Rosa 'The Pilgrim' is not one of the sale roses, I had to show it off! Psst. Don’t tell anyone, but they are the only place I buy my roses from. 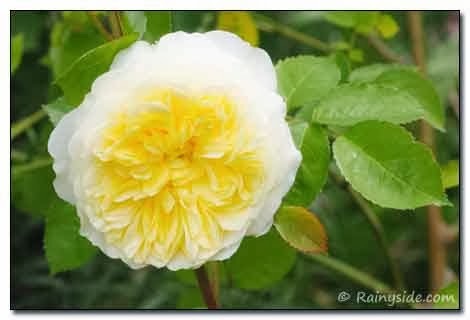 What gardener wouldn’t love a rose bush to grow? Heirloom Roses from St. Paul, Oregon will not only sell you some fantastic roses, they propagate and grow their selections in the Northwest. Even better, the roses grow on their own root systems! You won’t have to worry about suckers from the rootstock over powering favorite shrubs or climbers. Many of their roses are repeat bloomers, fragrant and disease resistant! From David Austin roses to old-fashioned ramblers, they have a huge selection. This week until December 9, they have a 20-50% sale on selected roses. Even if you miss this week’s sale, they promise more sales this month. I looked over their list and the prices are between $6.80 to $14.00. What a valuable gift to give for such a low cost! If you don’t wish to select a rose, consider a gift certificate and let your gift recipient choose their favorite! You can find great books from Beatrix Potter’s Gardening Life to Debra Baldwin’s Succulents Simplified, and many Northwest writers’ books are published here, such as Uncommon Fruits for Every Garden by Lee Reich. 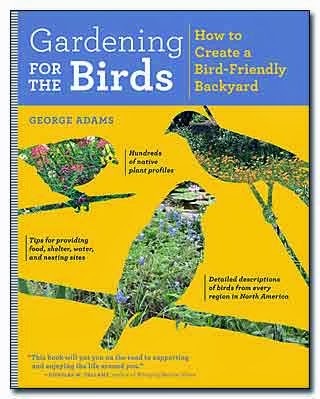 So many books for the gardener’s book shelf, if you can’t choose one for your gardener friend or family member, give them a gift certificate instead and let them choose the one they want. This nonprofit helps preserve exceptional gardens around the country. Every spring, summer, and fall (even winter in warmer areas) the organization selects outstanding gardens so that we the public can enjoy them. Memberships help keep the conservancy going and members receive 50% off on garden tour tickets. I go on almost every one of their outstanding tours from the Seattle to Portland area and I am never disappointed! 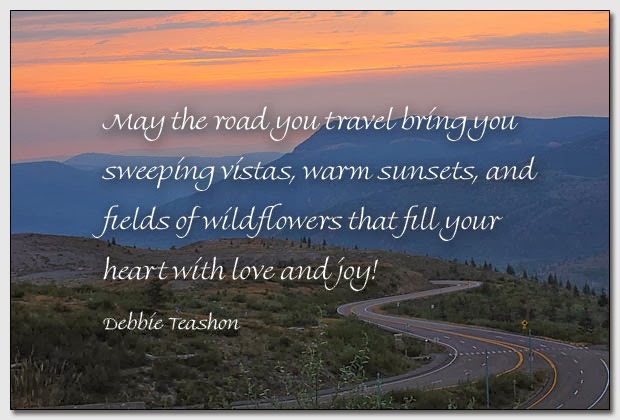 I want to wish you a Happy Holiday! 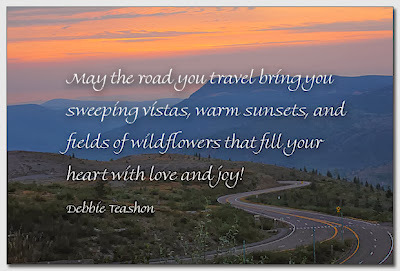 May visions of the coming growing season keep you warm throughout the winter season! 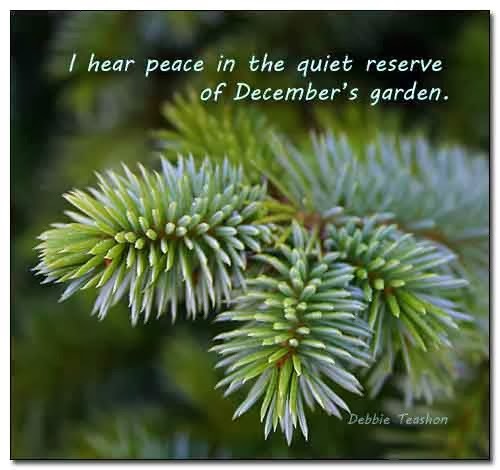 I hear peace in the quiet reserve of December's garden.